UPW - the next chapter - fire walk! Still great seating is VIP section that I can offer for 1295 EUR paid as 11600 SEK through Paypal. (Current organizers price is 1,795 GBP for these!) 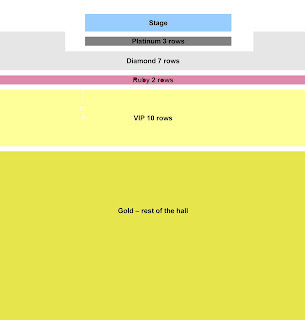 Or General Admission - behind Gold - for 725 Euro, paid as 6475 SEK (really cheap, further back in the room but still a great Tony Robbins experience.). ...to the transformational life mastery event 'Unleash the Power Within' - UPW - with Anthony 'Tony' Robbins. Discounting last ticket for Ruby section (row approx. 11-12) to 820 Euro! To compare with 695 Euro for the seats in the back of the room now for sale for Gold section. The closeness to Tony's energy is worth every penny in this kind of event. All paid through paypal in SEK: 825 Euro converts to 7300 SEK for Ruby and 695 Euro converts to 6200 SEK for Gold. Discounts if bank transfer is used. Deside today to avoid disappointments. Ticket are selling quickly in all sections. Gold, Diamond and soon Ruby is now sold out. Last chance for great seating to great price. Let us know of your interest asap to avoid disappointments. Soon time for the mighty Unleash the Power Within! Ticket update: some returns and some sales leave a remaining of three tickets for Ruby section. Why make the hassle of going if not having proper seats? Ruby means Row 10. Price 895 Euro at paypal payment or 875 Euro at bank transfer. It's Time for Tony in 6 weeks! Well, up to a few years ago Tony planned the European UPW a few years ahead. Meaning that we would know that he was coming back and we and our customers could do more long time planning. Now, and same thing last year, the upcoming UPW was the only one planned and he would decide after that UPW event that he would do it for another round. Tony is getting older and he has problems with his voice and back and we have full respect for that he limits his engagement. And for sure we know that in a few years time he will not do as many UPWs as today. So all we can say is that we don’t know if he is coming back for another UPW next year. Still a pair of tickets in the special Ruby section left, act not to avoid disappointments. Tickets are available in all other sections. TimeforTony has many years of experience with Tony Robbins and UPW tickets. All tickets at TimeforTony are 100% authorized and official. Through the years we have developed the purchase to be 100% safe through Paypal or bank transfer. Translation service is available. Preparation call with one of Tony Robbins’ coaches is available for free also before you buy the tickets. UPW and coming closer and there is a different vibe around it now. It is somehow more real, we are counting weeks instead of months. The excitement is increasing by the day. After an event such as UPW we usually get two kinds of comments from the people we’ve been in touch with beforehand. The ones who got our limited ‘Great seat to a great price’ come back to thank us for really making the UPW experience the best for them through seats close to the stage. They thank us for (quote) caring (end quote) and making sure they got the great ticket – even though some say we could have talked them into something further back or to higher price, since they know nothing of the size, prize and energy of the event. The other comment is from people gotten their ticket elsewhere, maybe to save hundred euro or so or to sit where their friends are sitting, and ended up in the back of the hall. They say: why couldn’t you be more persuasive, why are you so… humble…? of course knowing afterwards that their seating wasn’t that good after all, and having made the sometimes long journey and travel investments to get there. Well that sums us up pretty. We are distributing tickets as if it was to our friends. We are modest, we keep fair prices. We are fair in informing about UPW. The feedback we get from you dear customers is a drive for us making this year after year. We are down to the very last few of the limited Ruby section. We still of course gladly sell you tickets to the other sections. On Day 1, you will learn how to annihilate your fears. You'll have the opportunity to walk across a bed of hot coals between 700 and 1100 degrees Celcius, and in doing so, you'll understand that there is absolutely nothing you cannot overcome. Day 2 will give you the clarity and power you need to accomplish whatever you set out to do. Gain insight into what really matters to you and set new goals that will enrich your life at the deepest level. Then, develop innovative skills and techniques that will help you stay on track while garnering exponential results in both wealth and personal relations. Day 3 is designed to integrate your key decisions and to ensure that you move forward with so much strength and verve that you never look back. Learn how to model others to master absolutely anything and to trigger global changes in all areas of your life. Finally, Day 4 is about stepping into a fresh new life with vitality and inexorable energy. By learning how to care for your body—life's most precious gift—you enable yourself to prosper and live life to the absolute fullest. Get in touch soon for the last of the Ruby seats! Everyone who consider going to UPW in London should also consider the seating versus the ticket price. At UPW there is a ‘Ruby’ section, this is not that much talked about basically since it has a very small number of seats and because this was sold out very early. TimeforTony has a few tickets for sale to this in many senses perfect section for UPW in London in May. Why so perfect? For those extra euros compared to in the back in room you can leave your binoculars at home. Nor you will be watching the videos screen next to the stage (because you are so far away from the stage) - you will be able to take in Tony directly from 25 metres away! And you will be assigned to a very small section meaning no elbowing to find a good seat every morning. Another question/concern we had was from a person that had friends with tickets in sections further back and wants to “sit amongst them” for company. The answer is simple: you should not sit with your friends anyhow, this a transforming process with lots of pairing up exercises and these are better done with a stranger (that you usually become friends with), even if you are going with your spouse or best friend. You can then be more open for the process. Also you will see your friends plenty in the breaks and at meals. And as you might know UPW involves fire walking. A truely life changing experience. Oprah join an UPW in the US and here is her fire walk. Let Tony show you to your real potential!